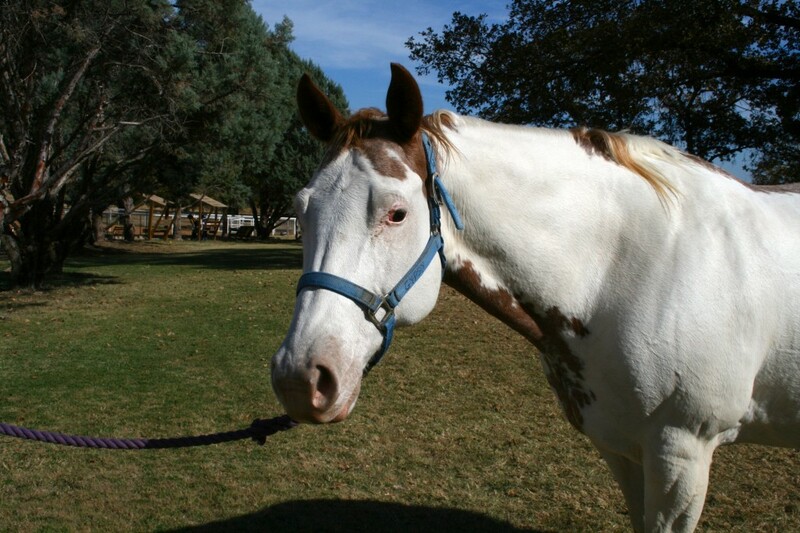 Gypsy is a Sorrel Overo Paint horse. She is 14 years old and has been with Rocky Top for 7 years. Gypsy has to be the fattest therapy horse we have. By exercising her we have gotten her to lose a few pounds but she will probably always be super fat. Gypsy is one of the few horses we sometimes ride double on. Because of her size, strength, and bombproof personality we sometimes put a disabled rider on who needs a “back rider”. A back rider is a volunteer who supports the rider by sitting behind them while on the horse. Gypsy is very lazy and likes to go slow, this can be a good thing with some of our riders. No amount of kicking, wiggling, or screaming is going to make that horse go faster or perhaps start to trot unless a leader asks her too, even then it can be hard. Gypsy loves being out in her pasture and eating, which is pretty evident given her size. She is a wonderful therapy horse for our riders.